Remembering Pierre Henry, A Composer Who Made The Everyday Extraordinary : The Record The vanguard French artist — whose influence has touched everything from the Mean Girls soundtrack to the Futurama theme — has died at age 89. 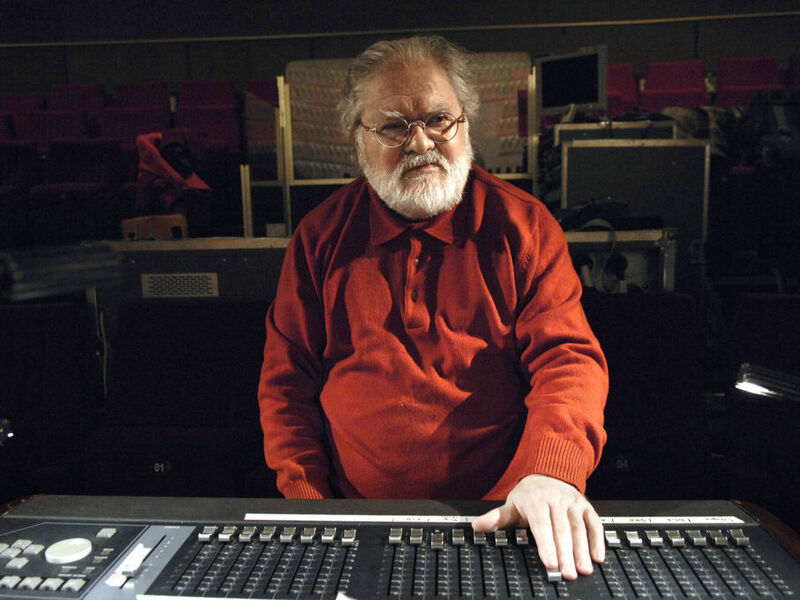 The late composer Pierre Henry, in a 2008 photograph taken in a Paris studio. A daring French composer died earlier this week: Pierre Henry, who was 89 years old when he died on the night of July 5. His death was announced by his assistant and friend, Isabelle Warnier, though the cause was undisclosed. Pierre Henry was in love with noise. In a 2007 documentary about his work called The Art Of Sounds, the composer is shown going out for a walk and stopping to compliment a runner. "The sound of your steps is very beautiful, sir," Henry declared to the startled man. In his early 20s, he helped usher in a musical revolution with a style called musique concrète -- "concrete music" — collages of prerecorded and manipulated sounds from both electronic and acoustic sources. In The Art Of Sounds, Henry spoke about how deliberately he created those collages. "Musique concrète is the art of decision," he said. "It's the art of choice. You select one sound over others and that's where composing begins." "The lone man should find his symphony in himself, and not just solely in conceiving music abstractly, but in being his own instrument. A lone man possesses much more than the 12 notes of the voice [in an octave]. He cries, he whistles, he walks, he pounds his fist, he laughs, he moans. His heart beats, his breathing accelerates, he utters words, he calls out and others respond." Though musique concrète was born in rather rarefied air, it soon found its way into pop music: Just think of The Beatles' "Revolution 9." And Pierre Henry's own compositions found a home in pop culture. In 1967, along with Michel Colombier, Henry wrote the score for a ballet by choreographer Maurice Béjart called Messe pour le temps present (Mass For The Present Time). That ballet included some music, in a section called "Psyche Rock," that became a touchstone for generations of DJs and producers who followed Henry. You hear it in the score of Costa-Gavras' 1969 Oscar-winning film, Z. Henry and Colombier's original music appears in the screen version, but composer Mikis Theodorakis penned a very similarly styled piece for the soundtrack. It also pops up in the 2004 movie Mean Girls — in a remix by Fatboy Slim. And composer Christopher Tyng appeared to be heavily inspired by Henry when he created the theme for the cartoon Futurama. But as modern as Henry's work sounded, he believed it was truly organic. "I think that nature was my first influence," Henry said in The Art Of Sounds, "and the sounds I heard during my childhood. They remained a part of my inner life." Pierre Henry took those sounds from nature, combined them with his imagination — and influenced generations of musicians.